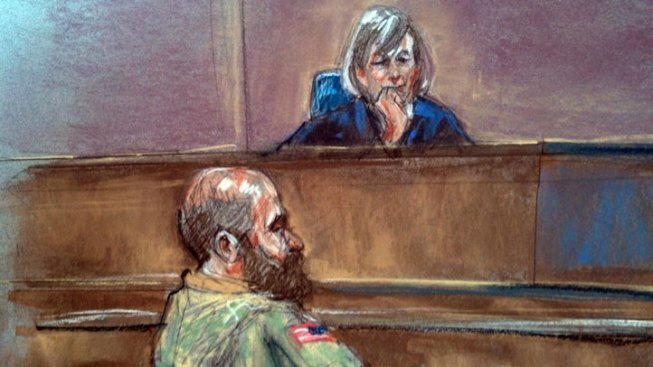 Military prosecutors rested their case Tuesday against the Army psychiatrist accused of killing 13 people during the 2009 shooting rampage at Fort Hood. The judge adjourned the hearing after prosecutors rested, meaning Hasan could begin his defense Wednesday — but whether he will seize the opportunity remains to be seen. Hasan is acting as his own defense attorney, but he questioned only three of prosecutors' witnesses and has raised few objections. Even the judge, Col. Tara Osborn, seemed skeptical. "We'll resume tomorrow with the defense's case, if any," she said. Hasan has kept mostly silent for the first two weeks of his trial, making whether he will take the witness stand in his own defense a key question for the remaining proceedings. Hasan signaled Tuesday that he may call no witnesses, saying he no longer planned to call a professor of psychology and religion at San Francisco Theological Seminary. He did not give a reason, but the professor was the last of two witnesses Hasan had initially said might testify. The move visibly concerned Osborn, who said she wanted the professor at Fort Hood in case Hasan changed his mind. But Hasan balked. "I object. I'm not going to be using him," Hasan said Tuesday. "So to waste his time when he has other professional responsibilities doesn't seem fitting, when I don't intend to use him." Hasan, an American-born Muslim, began the trial by telling jurors that he was the gunman, and he has leaked documents during the trial seeking to justify the shootings as a defense of this faith. Prosecution witnesses, including several soldiers who were shot during the rampage, described how a lone gunman wearing Army fatigues shouted "Allahu Akbar!" — Arabic for "God is great!" — before drawing a laser-sighted pistol and opening fire inside a medical building on the sprawling Army post. The building was crowded with unarmed soldiers, many preparing for deployments, getting vaccines and tests. When asked to identify the gunman, witnesses pointed at Hasan, who was left paralyzed and wheelchair-bound after being shot by officers responding to the Nov. 5, 2009 shooting. One of the witnesses, Steven Bennett, who was unaware of the shooting in other buildings, said he talked to Hasan who told him that his weapon was a paintball gun and that a training exercise was underway. Bennett later photographed Hasan on the ground after he had been shot by law enforcement. Testimony from medical examiners revealed that at leave five of the people killed had been shot while lying down. An FBI agent testified that Hasan's apartment was nearly barren when searched the night of the shootings, with little more than a folding table and prayer mat. Among the three witnesses Hasan did question was his former supervisor, retired Lt. Col. Ben Phillips. Hasan mumbled through a series of rambling questions about "medical personnel initiating mercy killings" and a water supply in Iraq being contaminated with gas. He was cut off by prosecutors' objection, which was upheld by the judge. The judge handed prosecutors a setback on Monday when she blocked much of the evidence that they said would explain Hansan's motive, including references to Hasan Akbar, a Muslim soldier sentenced to death for attacking fellow soldiers in Kuwait during the 2003 Iraq invasion. Prosecutors wanted to prove Hasan's attack was a "copycat." But the judge said such material would "only open the door to a mini-trial" of Akbar and result in a "confusion of issues, unfair prejudice, waste of time and undo delay." Hasan is facing numerous counts of premeditated murder and attempted premeditated murder. If convicted, he could face the death penalty. However, Hasan has done little to defend himself so far. He even acknowledged, during his brief opening statement at the beginning of the trial, that the evidence would show he was the shooter. Hasan has hinted at his defense in the form of media leaks, including authorizing the release of a report from mental health experts who determined he was fit to stand trial. The report includes a statement from Hasan in which he speculates he could still be considered a martyr if convicted and executed by lethal injection. The military defense attorneys ordered to help Hasan during the trial have accused him of trying to secure himself a death sentence. They have asked that their responsibilities be cut back, but Osborn has denied their requests. The specter of an almost-certain appeal has hung over the long-delayed case. If Hasan gets a death sentence, the case will automatically go to the military appeals courts, which have overturned most of the death sentences they have reviewed.